In the past few years European Union introduced strict laws for land filling in order to maximize the recovery of recyclable materials. This aim currently cannot be realized by many European plants when they have to deal with mix cans waste from MSW. This waste is composed by mix metals (above all iron, alumnium and steel) and home-made inert like nylon, plastic, glass, etc…The production of this kind of waste is increasing, according by the recent EUROSTAT report with about 42,3 millions of tons every year. MSW waste is not homogeneous because of an ineffective collection in the capitals and in metropolitan cities. The inert concentration can reach 60% compared to metals and it is considered to expensive to treat, but at the same time not complaint for the European landfills. To maximize the recovery cycle, the enhancement of metallic proler could be an interesting business opportunity. In this way iron, steel, stainless steel and metals like aluminium, copper and brass could be reintroduced in the production cycle. Anyway, foundries impose strict rules for an optimal cast of the product. Consequentially the companies cannot rely only on manual sorting, openers, or optical readers/X rays. The solution is a grinding plant. A top quality hammermill frees the metals from inert, simplifies the final steps of separation and maximize the commercial value. A company that takes this path need to ponder carefully the technical features of hammermill for scrap. Grinding the mix cans from MSW with not suitable models leads to serious economic and productive damages in a short-medium time. During the process the hammermill undergoes to processing peaks, stressing many mechanical components, causing structural damages in the ineffective models. The productive safety needs to be guaranteed by structures and armours suitable for MSW, speeding also the access of the elements involved in the grinding. These elements in comparison to other processes has higher wears, caused by the presence of glass and steel. A constant problem in hammermills with medium-low price range, economically penalizing productivity and spare parts management. The suppliers which provide higher quality solutions have introduced successfully special cast alloys for horizontal hammermill. Hammers and grids have a slower and more gradual wear, keeping constant the output quality and avoiding the stops caused by light inert materials floating in the grinding chamber. Flexibility in material treatment is an important feature for hammermills. The speed in changing the configuration of grids is essential, especially with this kind of waste. Nowadays few suppliers are able to ensure this essential feature in plants for the enhancement of mix cans from MSW. The suppliers commitment and professionalism have enabled to renew the approach method of the treatment. The material is not moved from a plant to another in order to be exported, buried or burned, even more plants are able to enhance metals from MSW, obtaining secondary raw materials and reintroducing them on the market. In a short time Panizzolo will complete the site extension works, doubling both the production area and the offices in Giacomo Matteotti street. Last year the growing amount of work led to enter new skilled staff in technical, sales and after sales departments. In 2019 there will be the development of the production area that will be used for the pre assembly, testing of the machines and plants. New offices and meeting rooms will welcome our visitors. The employment of sales and technical personnel is a guarantee of professionalism and quality. In this way Panizzolo has increased even more the assistance and the management of clients needs. In January 2019 Panizzolo participated at IERC congress, annual event which gather in Salisbury the most important international companies, specialised in the management of WEEE waste. The speech of Matteo Turatto, Panizzolo sales manager, was this edition news. This event enabled to deepen the fluff treatment from WEEE waste and mix metals, to enhance copper, aluminium and steel contained inside of them. A very important issue for companies all over the world, which are forced to send a lot of tons of fluff to the landfill, material which could be recover. Turatto, during his conference, compared the waste disposal with a specially developed treatment process. With the help of video clips of running plants in Europe, the exposition was related also to economic calculations on treatment, from data on recovered metals and output photos. The technology of the plant works thanks to a complete mechanic and automatic treatment. The hammermills inside have been especially designed and patented. All the recycling solution works completely in line, enhancing metals with End-of-Waste cycle. This refining plant, one of a kind in Europe for the treatment method, is the result of long tests at Padua plant and its aim it’s not only the separation of output materials, but overall the maximisation of the commercial value for sale. The concreteness of the issue exposed has impressed different companies at the congress, that, at the end of the conference, took the opportunity to make more questions both in the conference hall and at Panizzolo stand. Launched at the beginning of 2019, the new Panizzolo refining plant for fluff waste management. Also presented in January during the IERC conference (in which Panizzolo participated with a dedicated speaking session), it consists of a Panizzolo patented hammermill that is designed to complete the Fluff waste cycle and obtain EoW metals output by recovering steel, aluminium and copper (even coils and electric motors). Solid waste in input are differentiated into the following types: Fluff from mixed, crushed and ground metals, Fluff from floatation systems, car fluff (from discarded vehicles), WEEE recycling fluff and other secondary mixes. The refining system is designed to recover metals with an End of Waste cycle logic. On completion, it obtains granulated aluminium, copper and steel that is completely separated and classified as secondary raw materials. RAF-M and RAF-F hammer mills are Panizzolo refining plant’s core operation. Perfect after extensive tests carried out at the Panizzolo scrap and waste recovery plant at Padova, this category of hammer mills guarantees reliability and safety in fluff waste management. 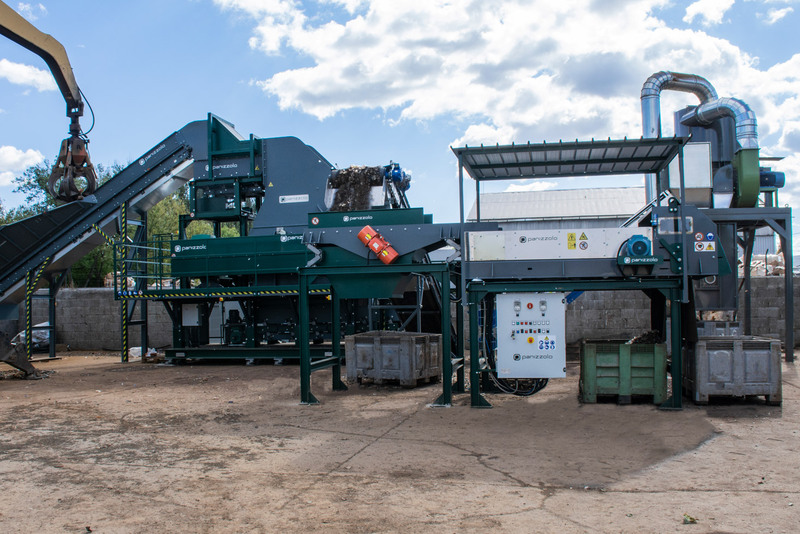 As opposed to electric cable shredding plants (structured to separate copper, plastic and shred aluminium cables without other foreign metals), the Panizzolo hammers mill refiner has a fixed and mobile hammer rotor. By means of a reinforced structure, patented machining logic and components with special casting, the plant is perfectly in line with the treatment and recovery quality required by the company in North Europe. Our client treats complex waste composed of: copper, aluminium, plastic, fabric, cables with earth coupling (with presence of steel and nickel), radiators with iron reinforcement, pins with steel, cement powder and glass powder from WEEE, metals mixed with steel and iron (from grinding electric motors) and many more. Thanks to the unique hammermill refiner, Panizzolo ensures a method of recycling waste that is difficult to handle (and usually started at the landfill), almost completely automated, while components subject to wear are designed to maximise the service cycle and simplify replacement. The solidity of Panizzolo waste treatment plants is proven by the said company that still operates in continuous production cycles. The recovery of metals and separation from inert materials is carried out with an automated mechanical treatment cycle. The mixed fluff is ground, separated from magnetic components and finished off with granulation and separation of copper and aluminium. Following the waste treatment regulations and aiming to obtain commercially marketable renewable metals, the Fluff waste treatment and recovery plant guarantees a higher quotation of the metal output, especially increasing the valuation of the sales price of the copper granule. This is proven by the Panizzolo scrap and waste recovery plant, certified manufacturer of secondary raw materials (Mps: EU 333-2011 and EU 715-2013). Requests for this new technology are constantly on the rise in Italy and Europe. Completing the waste cycle with a single plant that works End of Waste (EoW), management of waste fluff and car fluff opens the doors to new perspectives to which the market is reacting with great interest. European companies acknowledge that Panizzolo, by means of its refining plant, has been able to transform a large problem into an interesting business opportunity. Pollutec will be held at Eurexpo Lyon (France) from 27th to 30th November 2018. With an exhibition space of 65,000 m², Pollutec is the leading French trade show for all professionals in the environment and energy, which brings together all sectors of the circular economy: waste recovery, recycling and treatment of scrap metal waste and more. Panizzolo will attend this exhibition at STAND 214 – HALL 3 – ALLEY C.
From November 6 to 9, 2018 the International Trade Fair of Material and Energy Recovery and Sustainable Development of Ecomondo, will be held in Rimini. Panizzolo will be attending this exhibition at STAND 047 – HALL A3. The Ecomondo days will give us the chance of meeting you all and show all the news presented by Panizzolo during the event. All EU countries have big problems related to the disposal of mixed waste from urban centres. The possibility to recover aluminium and iron content (especially from post-consumption tins) is strongly impeded by the high percentage of plastic, nylon and other wear-resistant inert materials (such as glass), which makes the treatment for the systems offered by the market excessively burdensome. Until a few years ago, such M.S.W. was sent to a landfill, which is no longer possible given the recent stringent regulations and the gradual closure of collection centres. However, conveying this waste to a complete and effective recovery cycle remains a current problem. Panizzolo offers a concrete and efficient solution thanks to its recycling plants. 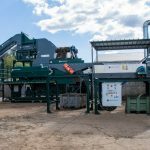 A plant was opened in September in a large Eastern European company, dedicated to the recovery of aluminium and ferrous cans from from municipal solid waste (MSW). Consisting of the Stationary Flex 1000 hammermill (250 kW – production up to 10 ton/h), complete with a patented interchangeable cradle, as always. The Stationary Flex 1000 performs an excellent grinding process, thereby obtaining high quality and density Proler in output. The final recovery takes place via a zig-zag air separator, series ZZ 10000, which releases the metal from light inert residues. Unlike the non-magnetic output, upon leaving the hammer mill, it is treated in line by the Panizzolo ECP 1000 eddy current, thereby completing the recovery and cleaning of the aluminium from inert. Fast installation and implementation of its solutions are standard in Panizzolo systems. The customer was able to immediately start working at full working regime in a very short time. Panizzolo quality is a factor that is also evident over time. The plants respect the key phrase “time is money”: they are designed to operate in continuous production cycles; maintenance is simple and basic; and the processing logic reduces the consumption of electricity (without affecting hourly productivity), also when recovering the most abrasive and heavy waste. Panizzolo from 23th to 25th october 2018, in partnership with NUFAR, will attend the next POL ECO SYSTEMS edition at Poznan Congress Centre (Poznan – Poland).